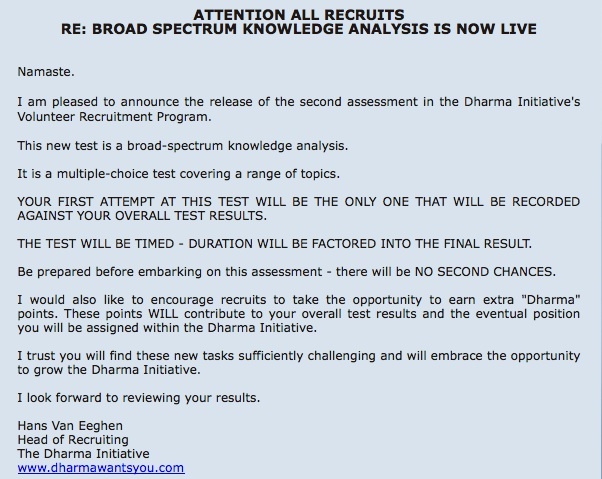 Well test 2 may be over for the most part, but today DWY sent out a reminder email newsletter to everyone that the test was actually available. I doubt many of us needed the message, however, but can't knock em for covering all their bases, and they must be a bit tired after making 100+ general knowledge questions. Click here to view the newsletter (or check Lostpedia's correspondence page). There is a little something in the source code, stating "The Dharma Initiative - Guiding the World to a Bitter Tomorrow - BS". Possibly a reference to the clue, using "i" instead of "e". Or another bitter reference, this is the second one so far after that "batteries ice pint" anagram. Also, is BS leety swear, or is it initials? The swear doesn't seem to fit the context, unless its describing the Dharma Initiative, with the slogan as a subordinate clause. It probably is just that though, as I'm not aware of any character by those initials, and we still don't know with 100% certainty that Dan Bronson is RuckusGuy yet!